Day 01 : Flight to India ( New Delhi ): Around midnight arrival in New Delhi . The cosmopolitan city and capital New Delhi is the main gateway for the travellers to India . Upon arrival, you will be met by an Indo Vacations representative and transferred to the hotel. Day 02 : New Delhi : The day is at leisure either to have sightseeing in Delhi or for relaxation. Day 03 : New Delhi – Manali by car/bus: In the morning after breakfast drive straight to reach Manali. Upon arrival, you will met by an Indo Vacations representative and transferred to the hotel. Manali is situated near the end of the valley on the National Highway leading to Leh. The landscape here is breath taking. One can see spectacular views of well-defined snowcapped peaks and wooded slopes. The Beas River rushes along its rocky course amid grassy meadows carpeted with wild flowers and wagtails hop along from stone to stone along the stream's edge. On the other side are deodar and pine trees, tiny fields and fruit orchards. It is an excellent place for a holiday, a favorite resort for trekkers to various regions in Kashmir valley. It is known as the Switzerland of India. In the evening we will have sightseeing in Manali. We will visit Hadimba Devi Temple , Vashisht Hot Water Spring, Naggar castle and Arjun cave. 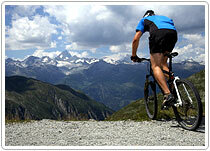 Day 04 : Manali - Marrhi (36 km ) Mountain Biking: Today we will begin our mountain biking tour from Manali. From Manali we will bike towards Rallah Falls . We have lunch at Kothi. Then we bike towards Marrhi. Arrive in Marrhi by evening. We will spend night in Marrhi. Day 05 : Marrhi - Jispa (111 km) Mountain Biking: Today in the morning after having our breakfast we leave Marrhi. From Marrhi we will bike towards Gondla. We will also cross Rohtang Pass , which is situated at a height of 3980 m. We have lunch at Gondla. Then we bike towards Jispa via Keylong. Arrive in Jispa by evening. We will spend night in Jispa. Day 06 : Jispa - Sarchu (95 km) Mountain Biking: Today in the morning after having our breakfast we leave Jispa. From Jispa we will bike towards Zing - Zing Bar. We have lunch at Darcha. Then we bike towards Sarchu via Baralacha Pass (4892 m) Arrive in Sarchu by evening. We will spend night in Sarchu. Day 07 : Sarchu - Pang (77 km) Mountain Biking: Today in the morning after having our breakfast we leave Sarchu. From Sarchu we will bike towards Tak and cross Brandy and Whisky bridges. We have lunch at Tak. Then we bike towards Pang via Lachulang Pass (5065 m) Arrive in Pang by evening. We will spend night in Pang. Day 08 : Pang - Rumtse (94 km) Mountain Biking: Today in the morning after having our breakfast we leave Pang. We will enjoy motor biking on flat stretch of road at the height of 4730 m. We have lunch at More Plains. Then we bike towards Rumtse and cross the Tanglang Pass (5360 m), which is the second highest motor able pass in the world. Arrive in Rumtse by evening. We will have an overnight stay in Rumtse. Day 09 : Rumtse - Upshi (35 km) Mountain Biking: Today in the morning after having our breakfast we leave Rumtse for Upshi. Arrive in Upshi by the afternoon. Evening free for leisure and relaxation. We will have an overnight stay in Upshi. Day 10 : Upshi - Leh (51 km) Mountain Biking: Today in the morning after having our breakfast we leave Upshi for Leh. Arrive in Leh by the afternoon. Upon arrival, you will be met by an Indo Vacations representative and transferred to the hotel. Evening free for leisure and relaxation. We will spend night in Leh. Day 11 : Leh – Thiksey Mountain Biking: In the morning after breakfast we will visit the famous Sankar Monastery, which is situated in the Indus valley. We will also visit the famous Hemis Monastery, which has some of the most precious Tankhas, silver Stupas and enshrines statues of various Buddhist gods and goddesses. Later we will bike to reach to Thiksey. Enroute we will stop at Stakna Bridge and have Lunch. We will arrive at Thiksey by evening. We will spend night in Thiksey. Day 12 : Thiksey – Spituk Mountain Biking: In the morning after breakfast we will drive to visit Thiksey Monastery. This imposing monastery, situated on a hill overlooking the village has a huge statue of Shakayamuni Buddha. We will also visit Shey Palace , which was earlier the Royal Palace . We will drive back to Thiksey and then on our bikes reach Spituk. In Spituk we have an overnight stay. Day 13 : Spituk – Leh Mountain Biking: In the morning after breakfast we will visit Spituk Monastery overlooking the whole Indus valley. Later we will drive to Leh. Evening free to explore the local market. Day 14 : Leh - New Delhi : In the morning after breakfast transfer to airport to board flight for New Delhi . Evening free at leisure (opportunity for the last shopping or enjoy a massage in the Hotel) After Dinner we leave the hotel for the airport.